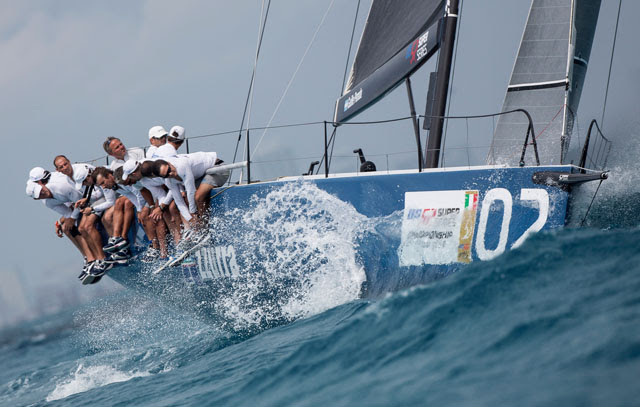 A second race win in succession, gained from the only race of the day, sees Azzurra top the leaderboard at the 52 US Championships in Miami, now leading Quantum Racing on count back. Although three windward leeward contests were scheduled Thursday on the strength of a favourable forecast for 13-18kts S’ly winds, the race committee made the prudent decision to send the fleet ashore on notification that an expected weather front had accelerated and was due to bring very strong, dangerous thunder squalls with the possibility of tornados. Following on from their race win Wednesday afternoon in lighter breezes, Azzurra were on impressive form. Racing more in their preferred wind range, the team which is skippered by Guillermo Parada (ARG) made the start that they wanted, at the committee boat end of the line and were then able to work the favoured right side of the course. Azzurra lead around the top, windward mark with a slight margin over the IRC optimised pair Interlodge and Vesper with Quantum Racing, always a threat, in fourth. Azzurra had built themselves a comfortable lead by the leeward gate and were able to keep control of the main group. Believing that the breeze had moved as far right as it would, Quantum Racing broke and took their chances left of middle on the second upwind – erring away from the leaders’ track – and were rewarded with a favourable approach to the final turn, gaining to second place. A swift gybe set on to a sustained gust from the top mark saw a great recovery from Rán Racing. Sixth at the final turn, they were within centimetres of catching third placed Interlodge on the line. Confidence is a key strength for the Azzurra team and with two good wins back to back, the Roemmers’ family team which races for the Yacht Club Costa Smeralda are on song here, certainly in their preferred conditions today. “It would have been good to race three races today but there is also an element that some of our guys hold a belief that you are only ever as good as your last race, but certainly we sailed well today. Everything was nicely controlled and we had the sense that we were always working to our game plan,” said Azzurra’s trimmer Simon Fry.